My wife thinks that as this beer calendar progresses I am becoming more difficult when it comes to my reviews. I was thinking about it, and I honestly might be. Not because I am treating the beers differently, I believe, but because I am trying so many fantastic beers it is difficult not to compare them to one another. The brewery started in 1882 and is located about 10 km from the Brussels city centre in the southwest of the capital. It is one of the last remaining authentic lambic breweries and is known of its lambic beer brewed in the tradition brewing method. Lambic matures up to 3 years in wooden barrels before being blended to make Oude Geuze, which is the young form, or first fermentation of the lambic beer. Sour cherries undergo fermentation in this immature lambic beer and after a second fermentation Oude Kreik is created, which is the matured version of this beer. This spontaneous fermentation and unique brewing process is possible because of the presence of special micr-oorganisms in the region. It is only possible in this region due to the existence of what they call “wild yeast” native to the Zienne valley where Brussels is located. 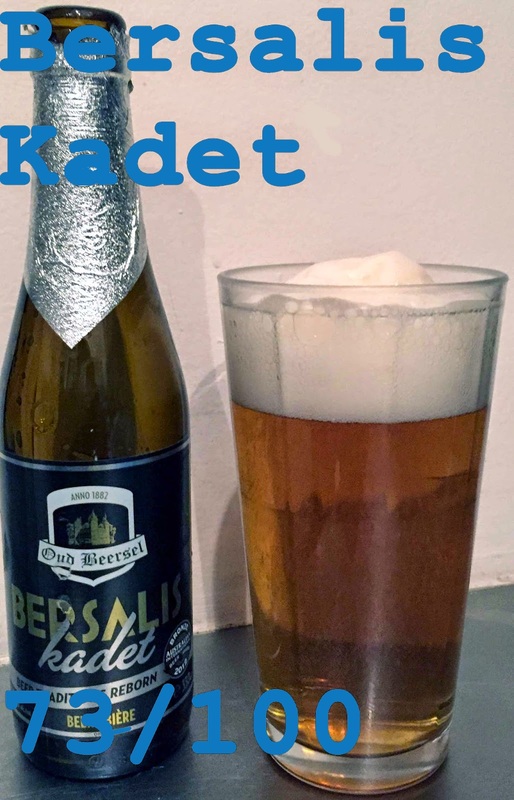 Luckily for me, because we’ve already tried a beer like this (Krampus), this particular beer brewed by Ould Beersel is a Belgian Ale that is brewed in the standard method. It is a Belgian beer brewed in the style of a lager. Lagers are a type of beer that is fermented and conditioned at low temperatures. The most common one consumed is a pale lager but other types include pilsners, and Märzen style lagers. Let’s give this one a try! Appearance: Clear golden brown/amber hue with significant head that retains very well. Taste: Cool and crisp with a dry finish. Slight fruitiness with a good sweet from the malt and a dry bitter finish from the hops. Good summer beer very reminiscent of a pilsner in flavor with its lightness and dry crispness. Mouth feel: Light body with crisp carbonation. Overall: Crisp, cool and refreshing this beer certainly brings a lot to the table. The sweetness is not overpowering but nor is it really there. There is some lacking in the flavor department as things tend to drift off as you get to the finish. While dry and bitter from the hops, it’s not really anything noticeable. This beer is good, but it lacks overall for other beers of the category..
Do I like it: I did enjoy the beer. It was refreshing. The flavors, while not overly noticeable, were still appealing and provided a nice good beer to go with a meal. It’s like they say, you don’t want a beverage to overpower your meal. This one would certainly be a good food beer as it allows the flavor of the food to come through.